Among the common fungi which attract a pedestrian during his rambles through a forest, there is one group which has been given the name Polystictus by the scientist. This is a genus of bracket-like species which are leathery, woody, or membranous from the very beginning of their growth. 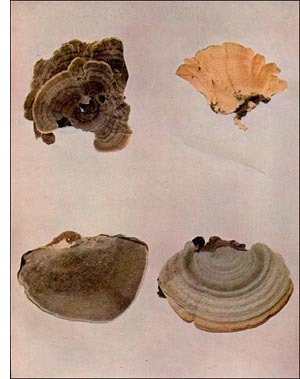 They are pore-fungi; that is, the fruiting spores are borne on the inner faces of tubes or pores which form a single layer on the underside of the bracket. These tubes usually appear first near the center of the bracket and gradually develop toward its circumference. A shell-shaped form occurs on dead twigs and small branches, both of standing and fallen trees of various kinds, especially of walnut and elm. The plants are small, thin, smooth, white, and of a spongy-leathery texture. At the first, they resemble very small shallow cups seated on the surface of the bark. As they increase in size, their shape becomes more or less spiral, the color pallid, and the surface marked by several consecutive furrows. The under surface is yellowish, afterward changing to gray. It is a pretty and delicate little species, which is less than an inch in diameter when fully grown. A parchment-like species is common on tree trunks of all kinds, particularly those of oaks, hickories, and poplars. The plants are thin, leathery, membranous, rigid, hairy, concentrically grooved, and white in color. The fruiting pores are at first a rich violet or purple color, but this color fades with age or upon exposure to sunlight, so that in old specimens the under surface has a dirty brown color. At first, the plants often grow as a layer, covering the tree trunk for a yard or more. From the surface of this layer the bracket-like growths arise, usually at short intervals from each other, and when fully grown may project an inch or more.